I have just put this wonderful vintage 80's Oleg Cassini (famous American fashion designer and close friend of Grace Kelly) dress on my website www.vintageclothing.com.au (50s to 80s page 4) and wanted to share it with my fellow blog followers. 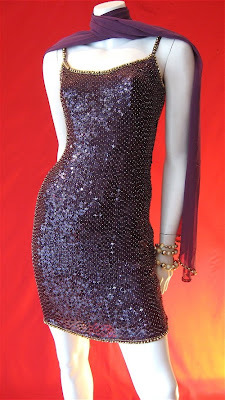 I am seeing sequins everywhere at the moment and think this one would be a complete knockout. Just love the colour too.